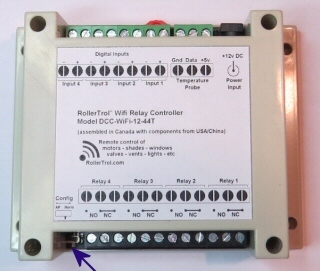 Our 12v WiFi relay control device uses your wifi router to control relay outputs for motors, valves, lights, etc. In the previous article, we looked at how to access your router admin to choose an available IP address on your local wifi LAN network. In this article we'll see how that IP address is assigned to your wifi relay module, using the Android app you downloaded at time of purchase. You should be sure to install the app before you start the configuration procedure below. Your wifi relay module normally appears as an addressable node on your wifi network, much the same as a wifi printer would. However, it is also capable of operating in AP mode (Access Point), which means it will behave as if you had another router in your home or office (in just the same way you can often see your neighbour's wifi routers). The AP mode is used only to configure the IP address for the module, and you will only do this once (unless you later want to change the IP address of the unit). You can put your wifi relay module into the AP configuration mode by powering off the unit and sliding the small white mode switch that is right beside the output relay screw terminal blocks (see the arrow in the above image, where the label says 'Config'). To get to the above screen on your Android device you'll need to go to the area where you originally connected to your local wifi network. If you have never done that, please refer to the manual for your Android device, or search the net for instructions regarding your particular Android device. It is usually quite easy to find the settings area, if you can't find the instructions. 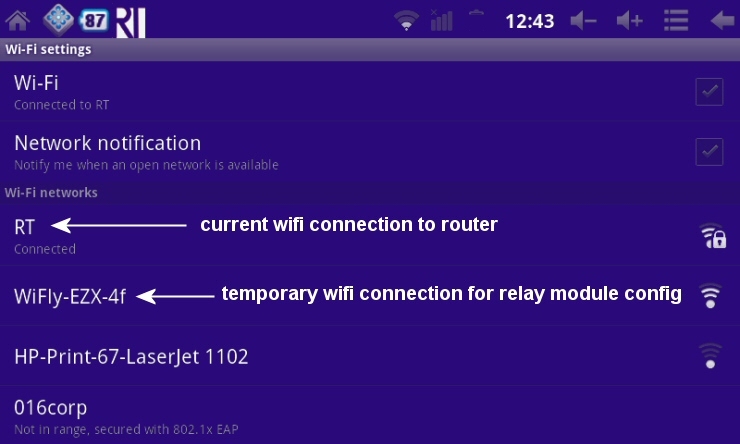 In the above picture, you can see that we are still connected to our regular wifi router (the RT connection), but the relay module has now appeared in the list of available wifi networks (the WiFly-EZX-4f connection) because we have switched the relay module to AP mode. Some newer units will display a slightly different name for the relay wifi connection, but it will be very similar to the above. You may also have to refresh your wifi network list, if you can't see it. At this point, you can disconnect from your regular router connection, and connect to your relay module. Keep in mind that once you do that, you will not be able to send/receive email or surf the net because you are no longer connected to your regular router. 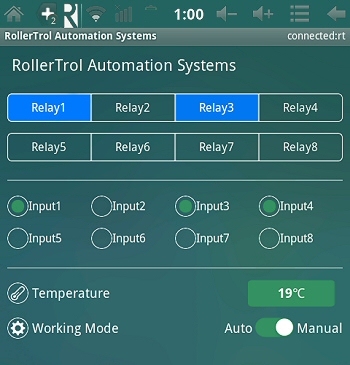 The screen capture at left of our Android app is displaying the configuration menu which appears when you press the menu icon at the top of the screen. 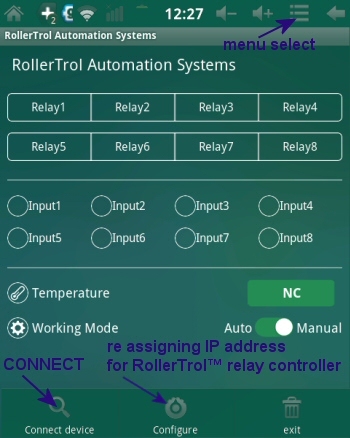 Please select the center option 'Configure' to start the process of assigning the IP address to the relay module. If you have not connected to the relay module via wifi, as per the previous section, it will time out in about 10 seconds and display an error message. Configuration is complete, please connect your router. Switch your relay board to normal mode and restart this app. To test it, please press a relay button; you should hear the 'click' of the relay activating, and it will light up the button with a blue color, confirming activation (like the picture above). Now you can connect fans, motors, valves, temperature sensors, etc. to it; we will cover that procedure in the next article.